Do you find it hard to keep funding for your fatherhood program? Do you rely on only one funding stream for your program? From a strategy perspective, is your organization on a never ending "fundraising roller coaster"? Do you want to get off that roller coaster? We will address all of this (and more!) 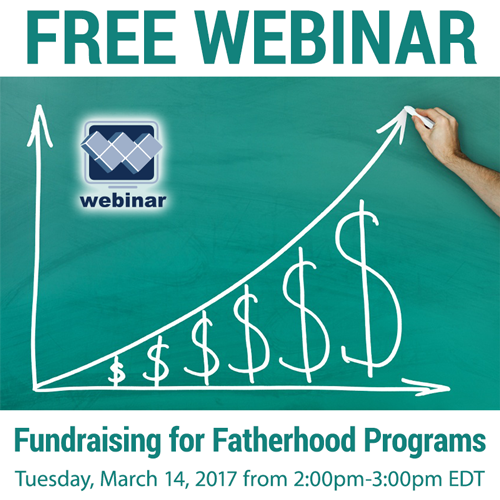 in our next free webinar: Fundraising for Fatherhood Programs. Register today! Join NFI's Vice President of Marketing Melissa Steward, for fundraising insight to help your organization diversify your fundraising strategy and guidance on how to create a fundraising plan. This webinar will cover fundraising "from soup to nuts" for fatherhood programs. Much of the content can also be used for fundraising for any non-profit organization or program! Be sure to share this opportunity with your colleagues and other fatherhood practitioners you know!